(Syracuse, NY)  The SUNY College of Environmental Science and Forestry (ESF) updated and demonstrated the latest efforts to go commercial with the extraction and production of ethanol from mixed northern hardwood with a day long tour on Monday, March 13, 2006. 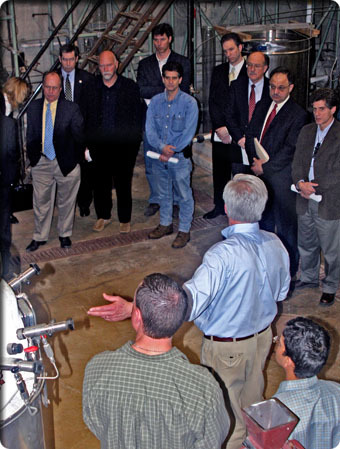 Congressman James Walsh (NY, 25th) and Congressman Charles Bass (NH, 2nd), accompanied by a delegation of industry and business leaders, attended demonstrations of newly installed, commercial capacity equipment on the ESF campus and heard from members of the research team including Jim Nakas, Tom Amidon and Tim Volk. Participants also heard from the developers of Northeast Biofuels LLC, an independent plan to convert the former Miller Brewery in Fulton into a major ethanol refinery first using corn and later using wood as a feedstock. They hope to begin retooling for ethanol production by this summer. “We wanted Congressman Walsh to understand that his faith in ESF is well-placed. Because of his strong support, we are less than two years away from delivering tree-based ethanol to the marketplace,” said Cornelius B. Murphy, Jr., president, of SUNY-ESF. “We also recognize that Congressman Bass, as a member of the House Energy and Commerce Committee, led the effort to ensure woody biomass was properly included in the Energy Bill among the renewable energy feed stocks and that projects like the Biorefinery in New York received fair consideration. We welcomed his participation in the tour with the expectation that what’s happening here can be applied throughout the northeastern forests,” continued Murphy. "There has been growing interest in the development of renewable energy sources over the past few years," said Rep. Jim Walsh (NY-25). "It's important to note that SUNY-ESF has been researching and developing the use of woody biomass as an alternative energy source since the mid 1990's. Together with the Center of Excellence and our chilled water cooling initiative, Central New York is poised to become a leader in this growing field of research." 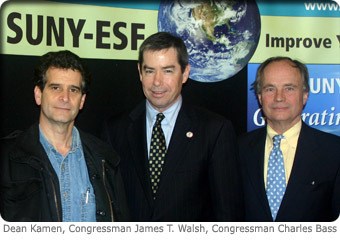 Since 1995, Congressman Walsh has used his position on the House Appropriations Committee to leverage $4.2 million for SUNY-ESF's woody biomass project, $1.5 million to begin the Lake Ontario water-cooling study, and over $29 million to support SUNY-ESF's Center for Sustainable and Renewable Energy and the Center of Excellence in Environmental Systems. "The hard work and research being done at SUNY-ESF demonstrates that the federal attention being paid to wood and other cellulosic energy research and development is sound. National and regional energy security requires that we explore and develop the resources of the Northern Forest in a sustainable manner. Transportation fuel has been a major problem for most alternate energy sources, which is why the work being done here is so critical," said Bass. "Congressman Jim Walsh and I have been working together chasing different ends of the federal tail, and I think we've now caught it just about right," continued Bass. SUNY-ESF has invented a method of removing energy-rich sugars from wood that leaves the cellulose, which becomes pulp, for use in making paper and the lignin for energy recovery. Also extracted is the wood’s acetic acid that is used in manufacturing. Ordinary wood chips are mixed with water and heated at high temperatures for a specific length of time. Water is the only solvent used. The watery solution that remains after the chips are removed is then forced through a membrane that separates the acetic acid and sugars. Commercial testing of the process is underway now that a 70-cubic foot digester has been built and a 400-liter fermenter installed in SUNY-ESF’s Walters Hall. Representatives from United States Senators Hillary Clinton and Charles Schumer, among others.